March 9, 2015 BalancedInBostonLeave a Comment on Save the Daylight? Monday morning is hard. The Monday morning after daylight savings is even harder. Especially if you have to wake up at the crack of dawn. 5am was finally starting to feel like dawn (it was getting a little lighter) but now is back to being middle-of-the-night- pitch-black, because just 2 days ago it was only 4am. Does this even make sense? No. Because I don’t think Daylight Savings really makes sense. Of all the things that really need saving, is daylight one of them? I know, I know. I’ll be happy when the days are longer and the birds are chirping and the sun stays out later. I love a good dose of Vitamin D as much as anyone, but for this already tired girl, the time change yesterday and the effects of it on me today are just adding insult to injury. Why can’t this happen around 4pm on a Monday? We should start a campaign to take back our weekend. Since I can’t obviously do anything to change the situation THIS year (next year the take back your weekend campaign will totally take off) I’ll try to focus on what I CAN do: I CAN Exercise today, drink lots of water, eat clean and try to hit the hay a few minutes earlier than usual. 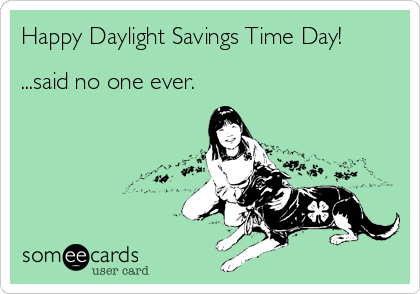 How do you save yourself from Daylight Savings?